You’re probably here at my blog because you love to read. Big surprise: I like to read too! I like to think of myself as a mediumly fast reader- I read 7-10 books a month, and 100+ books a year. I’m not stating these facts to brag about my “reading skills”, because I am not a reading goddess! I mean, there are people that read 300 books a year, which seems crazy to me, but maybe to you, 100 books is crazy. This post isn’t going to tell you how to actually make you read FASTER, because everyone has a unique reading speed, and you’re not “more” of a book lover if you read more or less books than others. Instead, I’m going to list ways you can read more, because so many people have asked me this, both in real life and online. I understand that if you have 5 minutes between classes like I do, it’s hard to read. But if you have thirty minutes until your next class, pull out your book and read instead of going on Twitter. Instead of spending ten minutes on your phone, read! This is like what I said in the last tip. You probably go on your phone a lot (I know I do). Instead, you could be using that time to read! I know that ten minutes might not sound like a lot, but it can really add up. Or, if you’re watching Netflix and finish an episode and want to watch another, consider reading instead! If you do three ten minute chunks throughout the day, that’s already 30 minutes more. I do most of my reading right before bed. It calms me down, makes me happy before going to sleep. It also makes me fall asleep faster. Besides, even though it’s hard, studies have shown that being on your phone right before bed is not healthy. If you replace that phone time with a book, woooo! 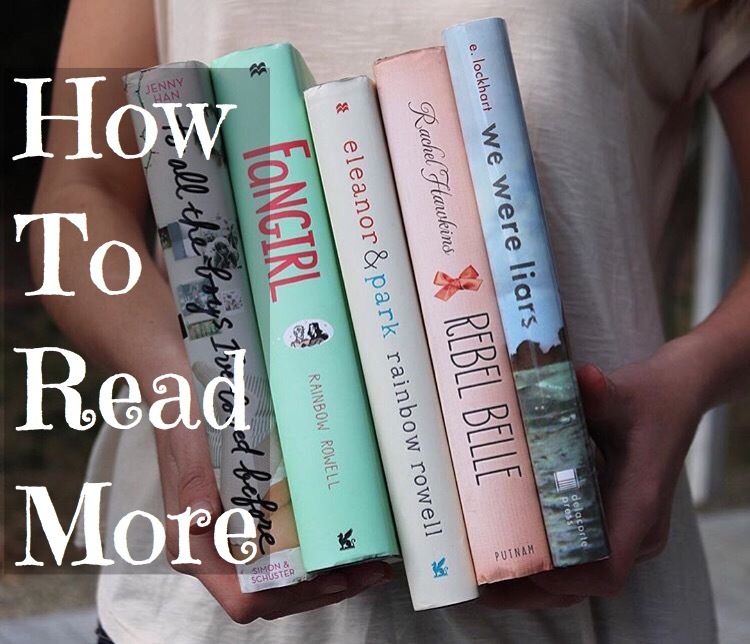 You’re being healthier and getting more reading time in. I mean EVERYWHERE. Even places that you think, Oh, I won’t have time to read, do it anyway. I do this, and it surprisingly helps a lot. Don’t force yourself, but push yourself. If it’s two o’clock in the morning and you’re holding your eyelids open to keep reading (okay, slight exaggeration), that’s not good. You don’t want to force yourself to read, you just want to push yourself as much as you can. Reading is for fun, it’s a hobby, it’s something you should do if you like it. Don’t make it not enjoyable for yourself! Audiobooks are perfect if you don’t have much time to read. You can listen to them on your way to work or school… There are a lot of amazing books narrated fabulously that you might love! Download the kindle app on your phone and read ebooks. I personally read ebooks so much faster than physical books, although I still don’t like them as much. Maybe this could work for you too! Plus, you won’t ALWAYS have a book with you, but usually you have your phone, so you could get reading time in easy! Read books you know you’ll love. If you have a favorite genre that you know you love, read books from there, or books that appeal to you! It’ll just help you not pick up books that might not be your style. If you’re not enjoying a book, don’t keep reading. DNF. Do-not-finish. Don’t force yourself to read a book you’re hating- it’ll just go slower and keep you from reading more! DNF-ing is not bad AT ALL. I hope these tips might help you with reading more! I know that I’ve used a lot of them recently, and they definitely help me read more books. How many books do you read a month? Are you happy with that speed, or do you wish you could read more? Next Post Do You Have The Time To Start A Blog? For me I totally read before bed and throughout the day! I pretty much read physical books BECAUSE I get through them faster since I bring them EVERYWHERE. Ebooks? Well, my school is pretty strict, so phones aren’t always allowed in the open! (URGH STUPID HIGH SCHOOL) 10 minute chunks TOTALLY add up, because I read books over 2-3 hours and 10 minutes is like 10% of that! I also really want to try more audiobooks. I just want more!! I can do the laundry and read, cook and read… They’re just so versatile! Thanks so much, Sasha! I’m glad I’m not the only one who brings a book literally EVERYWHERE. I hope you enjoy audiobooks! I do chores while I’m listening to them, and it works perfectly. Twitter is so addictive! I love reading before going to sleep too! It’s like a ritual. Hahaha! My day wouldn’t be complete with a few minutes allotted to reading, I read 5-7 books a month and I am not yet satisfied with that. I want to read more. I can’t keep up with my tbr. Hahaha! Oh good, I’m not the only one! And mine wouldn’t be complete either. I think 5-7 is great! I think all book lovers feel that way, haha. I am still not sure about audiobooks, I want to try them, but I am not sure I am a huge fan of those. The only time I’ve listened to some were when I was little. Thanks! I’d give audiobooks a try- at first I didn’t like them AT ALL, but I listened to one that I really enjoyed and if got me hooked! My goal at the moment is not actually read more books but read better quality books. I read waay more three years ago than I do now. Wonderful tips! I definitely read before bed. and bring a book with me everywhere I go – I agree they’re really helpful ways to read more. I think I read about 10 books a month? Maybe 15? Something along those lines, so I’m pretty happy with that. But things have a tendency to get busy again eventually so I’ll have to think about a lot of your other tips as well 🙂 Thanks for sharing! Thank you! I’m glad they were helpful. 15 books a month is amazing, good job! And yes, when life gets busy it can get so hard to keep up reading a lot. I definitely know what you mean. These are great tips! I would guess I read about 20 books a month, too. I am a fast reader and generally read a couple of hours at night (while my husband watches TV). Thanks so much! And 20 books a month is fantastic, nice job! Thank you so much! I’m really glad these tips helped. And yes, I SO have a book buying problem as well- I have books on my shelves that have been there for years, still unread! I hope you start reading more soon. Thank you so much! Yes, it took me a while to actually DNF a book, instead, I would say, oh, I’ll pick this up again later. But now I actually put them down. Haha, I can definitely agree with the reading before bed thing: it can be hard to put down an amazing book! I love this post, Ava! My speed is actually extremely similar to yours, and I tend to average 2 or 3 books a week. I also find reading while traveling is a great thing – especially if you’re on a bus/train/plane as I don’t know about you but I’m likely to get carsick if reading too long in a car! Another good tip is taking books to conventions or events (or anywhere you’re likely to be queuing, really. I always find that helps! Thank you so much! Oh, I didn’t even think of that, but YES! I definitely read while traveling. I don’t get carsick, so I love reading in the car. Ooh, I should bring books to places where there could be a line. Thanks for that tip! I read around 3 books a month. So 100 books a year is a crazy challenge. My challenge is 50 books, and I’m 3 books behind. But oh well, I don’t really care about the amount of books I read as much as I care about the quality of what I read. Thanks, Maha! 3 books a month is still really good. And for your reading challenge, I’m sure you’ll catch up soon! The amount of books I read in a month depends on many different factors (how much homework I have, how long the books I read are, etc). But I usually read 4-8 books a month. I usually read about 80 books a year. That’s great! And yes, sometimes the amount of books varies a lot from month to month. I usually read a lot more in the summer, because of no school, which helps me reach my reading challenge! That’s so great! This community has definitely made me read more as well, and I’m so glad. Thank you! I think that’s really good! I agree, you want to take enough time to make sure you get the full “reading experience”, haha. This year, on an average I read about 20 books a month. I honestly don’t know how I read that many. I’m happy with my speed, but with good books that I know are simply amazing, I’m aiming to read slower and absorb everything properly. Wow, that’s amazing! I totally agree. You want to be able to enjoy the book and sometimes, if the book is really good, you don’t want it to end!